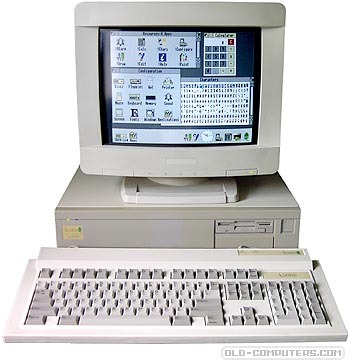 The Acorn A5000 was an all new model of the Archimedes family replacing the A540. It had 4 slots like previous models but a larger wider case making it look like a workstation computer. Many A5000s were fitted with SCSI controller cards and used with caddy-type external CD ROM drives for multimedia applications. Early models had just 2MB of RAM with a slot to allow a 4MB RAM card to be mounted on top. Later A5000s were slightly faster, had 4MB on the motherboard as standard and more generously sized hard disks. SPEED 25 or 33 Mhz. see more Acorn Computer Archimedes A5000 Ebay auctions !